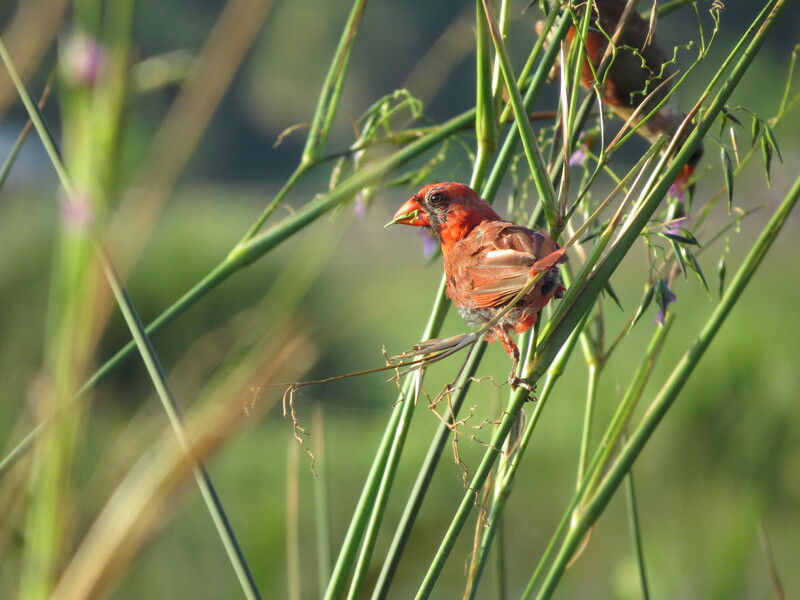 Remember those stunning, brilliant red Northern Cardinals we saw adorning the wetlands just a few months ago? Well, I did a double-take when I saw one of them recently in the same preserve. Now that it’s late summer in south Florida, this male Northern Cardinal, and his female friend (mostly-hidden there behind the Fireflag stems) are barely recognizable. He really doesn’t look at all ‘dashing’ in this shot! This ragged, half-bald look is due to molting, where old feathers are gradually replaced by new ones, a natural ‘renewal’ that occurs in many songbirds over the summer. All About Birds has some great information about the changes birds go through, and why, during the molting phase. On the other hand ….. Fellow blogger Pam raises a great point in a comment below about how young Cardinals also have this very scruffy look. Hmmmm….molting adult, or youngster?? 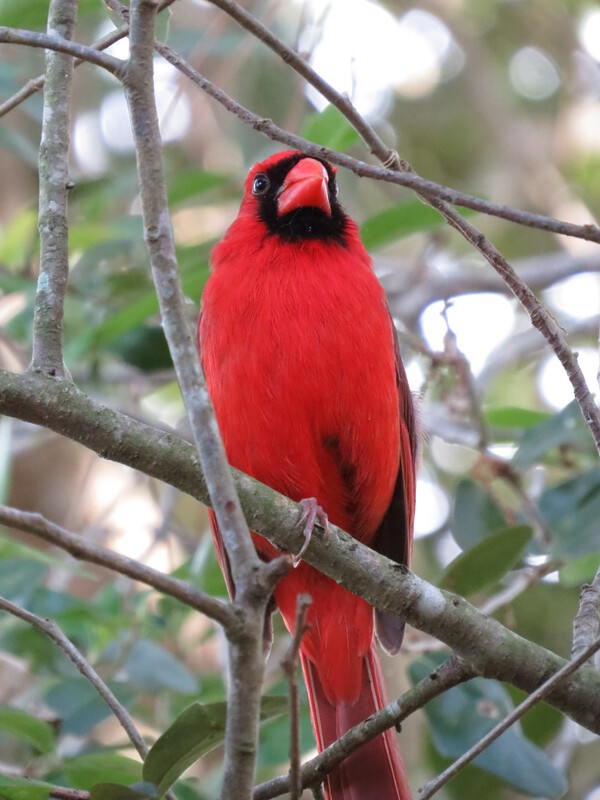 Despite his name – and the variation in his appearance – the Northern Cardinal graces us with his sweet song here in Southeast Florida all year long. “Northern cardinals have distinctive and beautiful songs with more than two dozen variations depending on the situation and the birds’ geographical region. Both male and female birds sing in courtship duets, and males will sing to advertise or defend their territory.” (http://birding.about.com/od/birdprofiles/p/procardinal.htm). Did you know that the Northern Cardinal is the State Bird of 7 states?? See even more about these wonderful birds here on All About Birds. This entry was posted in Birds, Marsh/Wetlands and tagged Northern Cardinal. Bookmark the permalink. Wow, what a capture of the Male Cardinal! So gorgeous, I think he knows he is. 🙂 🙂 Thank you for the “all about birds” link! Have a great long weekend! Thank you, Amy! Enjoy your weekend, too. The babies look really funny too as they grow in their adult feathers. Great pics! Wow, Pam….I think you may have revealed the truth here ;-). When we saw this scruffy-looking bird, we talked about him as if he was a molting adult. But maybe he actually was a young Cardinal, just growing into adult plumage. Thanks for that thought. They look similar at both those stages, don’t they? Wonder if we can know for certain. I think I’ll edit the post with that question! When the young males grow in their adult feathers, you’ll see several colors – some shades of brown, blue, and red. Very cool thing. The timing is perfect for that. Very cool to know, Pam, thanks! I’ll be sure to look more closely. I am not sure whether it’s a youngster or a molting adult, but the molting time is definitely here now. I can see it in the Ospreys too. They have feathers sticking out and no feathers in certain places, mostly visible in flight. I’ve understood this is a quite stressful time for the birds. Thanks, Tiny – the timing for seeing a molting Cardinal here in FLA is what made me assume this, too. But, after looking at some photos of scruffy little juveniles, I realize they can look quite similar. I appreciate your visit and comments! At times we’ve heard a cardinal singing in the trees in front of our house. I used to see them all the time in New York State, where they were of course the ubiquitous bright spot in the winter scenery on greeting cards. But it was only when I moved to Florida that I learned how many different songs they have. I grew up on Long Island and seem to remember that we had cardinals there, though they’re more common in Austin—or else I’m paying more attention now. We’re used to cardinals, but when I showed a photograph of one to someone in New Zealand he was completely unfamiliar with it and I think he had trouble believing we have such a brightly colored bird in the United States. HaHa. I guess brightly colored birds are generally associated with island nations – or at least with equatorial regions! So interesting that a beautiful bird like the male Northern Cardinal can be so very common throughout the entire US, and yet seem exotic in the Middle East. I also found that many of the birds in Israel that seemed exotic to me were really rather commonplace there. I’m eagerly awaiting my trip to the Eilat Birding Festival next March. It is funny to read the above comment on the cardinal being very exotic. In my area they as so common. It is like looking at birds in Australia that are common there and we think they are so beautiful and different. To us their birds are exotic. You really have a red male there that will surely get the females riled. He has been feasting on berries to make that coat shine. Thanks, Donna – I agree! LOL, this conversation somehow reminds me of the words of two author/birders! Jonathan Rosen wrote: “Birds don’t know boundaries, but humans are obsessed with them.” (The Life of the Skies: Birding at the End of Nature (p. 48). And Noah Stryker wrote “Geopolitical boundaries have nothing to do with birds”, and talked about how birders are often “obsessed with borders” – sometimes flying thousands of miles to catch a glimpse of a bird that is commonplace elsewhere (https://www.audubon.org/magazine/january-february-2015/welcome-birding-without-borders). What a great way to put it, Jet – I love the notion that the birds “keep us on our toes” in this way! Thanks for making the connection, Jet!